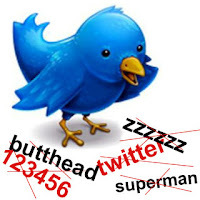 Flock Flock is a web browser that specializes in providing social networking features and other Web 2.0 features on the display interface. 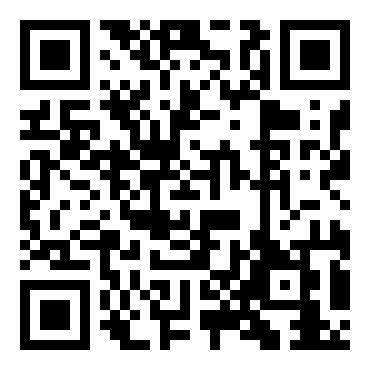 This is based browser Mozilla Firefox browser code. 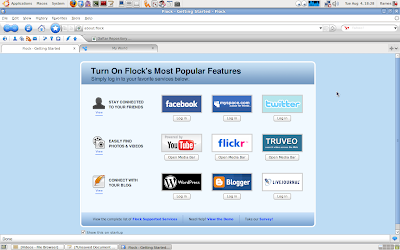 Flock browser is very suitable to be used by those who can be called too 'often' use of social networking website like Facebook, Twitter, Youtube, MySpace and others because there are some features that would facilitate users to access their favorite sites. 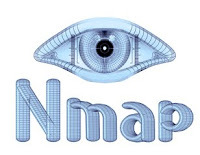 Easy access to Facebook, the ease of video search on Youtube and several other features, will allow its users. And because it is based on Mozilla Firefox, so we can add the Add-On to complete the Add-On is already there. Flock can be downloaded free of charge and available for Windows, Mac OS X and Linux. 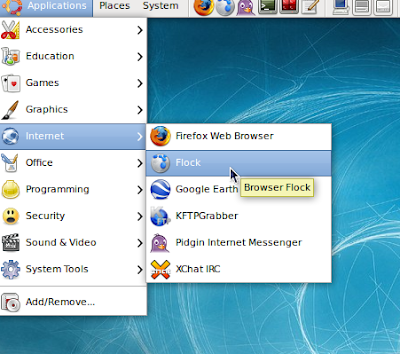 This time we will try to install the Flock browser on Linux Ubuntu. 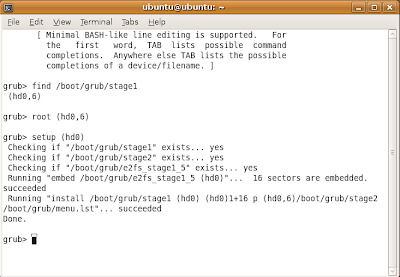 For testing purposes I use Ubuntu 9.04 Jaunty and likely most of the steps in this tutorial can be used by Linux distros other. Make sure you choose to download a version of Linux, located on the right. Save on your desktop for easy. Right-click on the file you downloaded Flock. 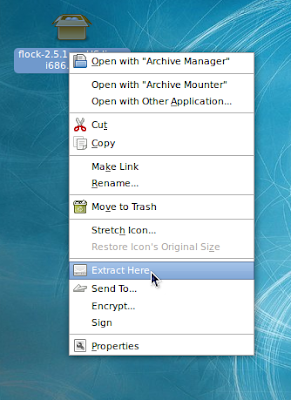 Select Extract here and then the desktop will display a folder called 'flock'. 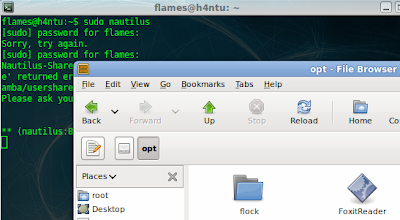 There will be 3 ways to become root so you can install Flock on the system. The first one, you are logged in as root, and it is not recommended. The second, you can do it by typing sudo on each command to be used and do it in the terminal, of course inconvenient for who is unfamiliar. And the third which I recommend is to open a terminal and type. In the Applications menu on the left you select Internet and then click New Item is located on the right. 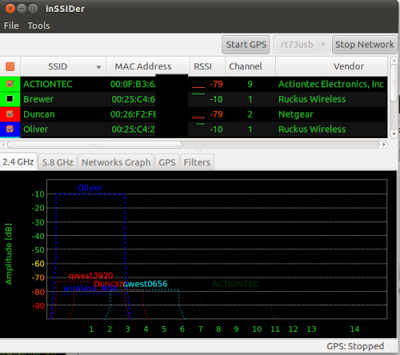 It's finished, now you can see Flock in the Applications menu - Internet - Flock. 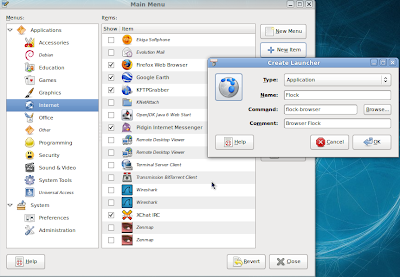 Next, you just put a shortcut on the menu Flock Panel or the Desktop menu, how to right click on the Applications menu - Internet - Flock and select Add this launcher to Panel or Add this launcher to desktop.